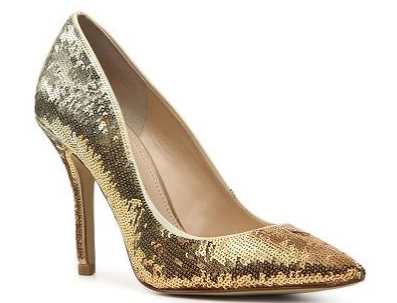 This dazzling sequined Persist pump by Enzo Angiolini (59.95 via DSW.com) has a great ombre effect. After girls' night out, they'll be a go-to for wedding season. Encrusted in tiny rhinestones, this Edrica pump by Nina ($54.99 via 6pm.com) adds quite a bit of sparkle to your step. Bonus: the hidded platform means you can dance all night. The block heel and single sole on this metallic Murphy pump by Report Signature ($48.30 via LastCall.com) make it totally trend right. Plus, this is one you can wear to the office with a pencil skirt or out to brunch with a pair of distressed jeans. 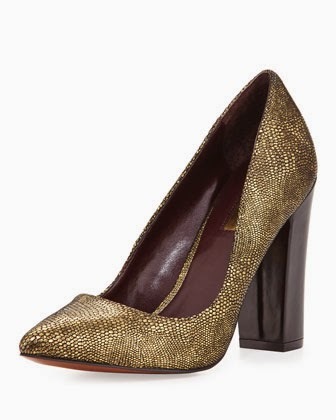 The high collar on this Domina pump by London Trash ($69.99 via Bakersshoes.com) adds an extra dose of fierce to its look, and the pebbled metallic suede makes it glamorous. This one has a 5" heel and no platform, though, so a pair of cushioned inserts is highly recommended. They're a little over the requested price, but I'd say they're worth it. 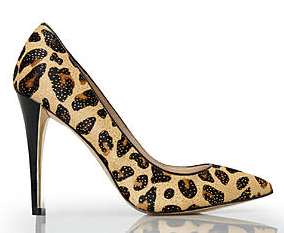 Even if it wasn't for girls' night out, this animal print Joan & David Amandie pump ($59.97 via C21stores.com) would be a must-have. Leopard print is the new neutral, so it goes anywhere with almost anything. Further, the glold dots add a subtle metallic sheen that seriously ups its style ante. Devon, hopefully one of these pairs will carry you through an amazing night out with your friends. Feel free to let us know which, if any, you picked. Ladies, if you need to put the Shoe Sleuth on a case, please feel free to send a note here or via the Shoes N Booze Facebook page.